On the verge of a forced retirement, Don Celso, an elderly office worker begins to relive both real and imagined memories from his life – a trip to the movies as a young boy with Beethoven, listening to tall tales from Long John Silver, a brief stay in a haunted hotel, conversations with a fictional doppelgänger of a real writer. Stories hide within stories and the thin line between imagination and reality steadily erodes, opening up a marvelous new world of personal remembrance and fantastic melodrama. In this playfully elegiac film, loosely adapted from the fantastical short stories of Chilean writer Hernán del Solar, Ruiz has crafted a final masterwork on his favorite subjects: fiction, history and life itself. 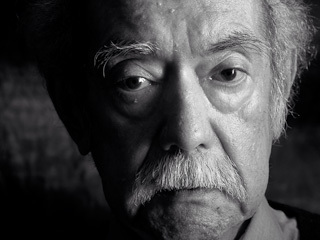 The great Raúl Ruiz died of a lung infection in Paris on the 19th of August 2011. Born in Puerto-Montt, in Chilean Patagonia, he had just turned seventy at the time of his death. NIGHT ACROSS THE STREET is the final film in his sprawling filmography of over 100 films. Shot between March and April 2011 in Santiago de Chile, it is a mysterious testament, the true meaning of which was not understood even by those who worked with him on the shoot. Ruiz conceived this film to be seen only after his death, a death which he knew was not far off.